Schlafly lets their Marzen ferment for several months in the way of the old timers, and fills the kettle with Munich-sourced malts and German hops. So you’re getting a traditional take on the style here. For something a little edgier, try their Imperial Oktoberfest, an 8% beer that’s not quite as sessionable. Bell’s is probably the only brewery that doesn’t go with the traditional “k” in the Octoberfest. It’s hop-forward on the nose, but balanced and malty on the sip. This is the second year in a row the brewery has put this beer out. This month is also Bell’s 32nd anniversary, so drink their beer. This is authentic to the original Oktoberfest beer as you can get, using 100% Munich malt and a Bavarian lager yeast and hops grown outside Munich. It’s so German, it practically has an accent. Left Hand has limited the distribution of this beer in the past, but thanks to recent production expansions, Oktoberfest will make its way into every one of Left Hand’s markets. The beer takes two months to finish. It’s all biscuits with a clean finish. Look for it in 12-ounce bottles. Out of Cold Spring, Minnesota, Third Street climbed to the second spot in our blind tasting last year, the highest ranked American Marzen in the tasting. It’s a lower ABV beer (4.6%) but Marzens are supposed to be easy drinking anyway. It’s dry, grainy and supremely drinkable. 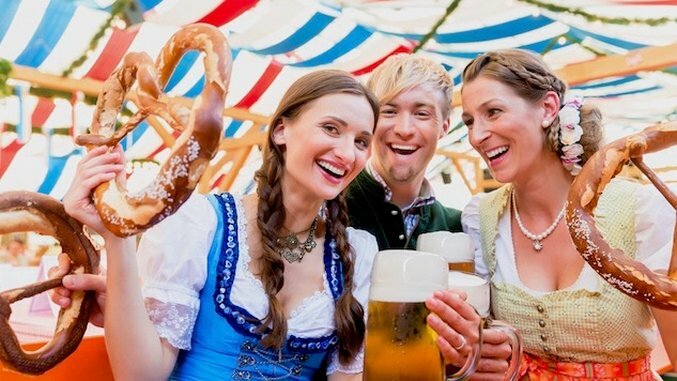 We’re in the midst of the traditional Oktoberfest, a beer-fueled celebration that runs from the middle of September to early October in Munich, Germany. It is a magical time that comes with its own beer—a traditional Marzen lager that’s brewed in March, lagered all summer and tapped in September. Oktoberfest beers are light and malty, full of notes of biscuits and caramel. We drank a lot of them last year for our blind tasting. They’re incredible and they don’t stay on the shelves long. Grab your giant pretzels. Here are six Oktoberfest beers you need to drink before they disappear.